Ringstar Boxing, Asia’s fastest growing sports media property, which has now reached an overwhelming broadcast footprint of over a potential billion viewers across the globe, just had its very successful ‘Roar of Singapore IV - The Night of Champions’, held last weekend at the 10,000-seater Singapore Indoor Stadium. The fight was also aired live in different parts of the world, via Fight Sports and Fox Sports Asia. Filipino boxer Michael “Gloves on Fire” Dasmarinas, won the IBO Bantamweight world title, after stunning Frenchman Karim Guerfi with a knock out, 40 seconds into the 4th round of what was supposed to be a 12-round bout. The 25-year old Camarines Sur native, had a month-long training in Japan to prepare him for the world title fight. Singaporean boxer Muhamad “The Chosen Wan” Ridhwan, on the other hand, stayed undefeated, now 10-0, and took home the IBO Intercontinental Featherweight Title that night. He faced Filipino boxer Jeson Umbal, in a 12-round bout, which the audience saw as a close fight. The scorecard went in favour of Ridhwan, which saw these numbers, 112-116, 114-115, and 111-117. 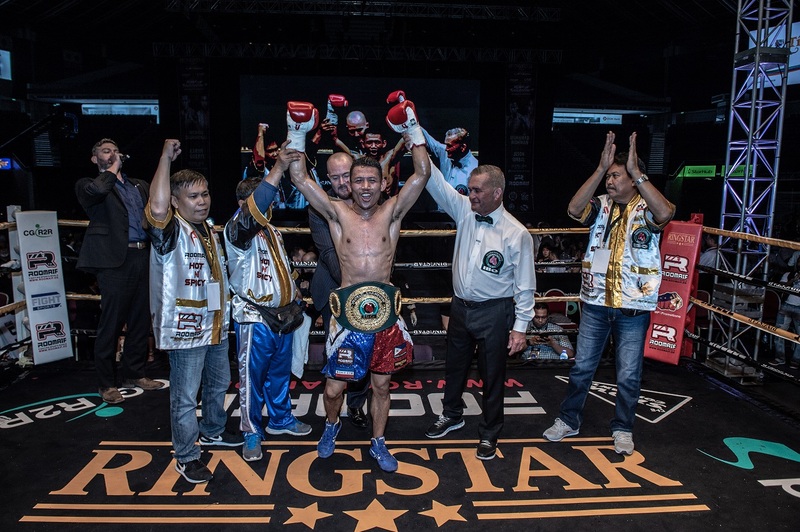 Ringstar Boxing, Asia’s fastest growing sports media property has now reached an overwhelming broadcast footprint of over a potential billion viewers across the globe, and is currently gearing up for its April 20 show, ‘The Roar of Singapore IV – ‘ The Night of Champions’, to be held at the 10,000-seater Singapore Indoor Stadium. Sponsors and Partners of ‘The Night of Champions’ include Roomaif International, Marina Bay Sands, and Alexandre Christie. Ringstar has a global live broadcast footprint of 1 billion viewers, plus broadcast partners that include FIGHT SPORTS Channel and Fox Sports Asia. Please visit www.fightsports.tv and www.foxsportsasia.com for more information. Get the latest announcements at www.ringstar-boxing.com and follow us at www.facebook.com/ringstarboxing and on Twitter and Instagram at @ringstarboxing. Cover Photo Caption: Michael “Gloves on Fire” Dasmarinas is declared the new IBO Bantamweight world champion at Singapore Indoor Stadium.